Intertops rakeback, bonus codes, cashier, game selection, company history, and more is thoroughly reviewed by our knowledgeable staff. By partnering with Intertops Poker, Professional Rakeback can offer a safe alternative on the Horizon Network to all of our poker players, all with daily 36% Intertops Poker Rakeback! Intertops Poker uses the dealt method of rake calculation, which favors tighter players. Rakeback is paid daily to your poker account directly by Intertops if you sign up through Professional Rakeback's signup link below. Intertops accepts players from most countries in the world, including those hailing from the United States of America; USA players rejoice! Sadly, Australians have been barred from opening new Intertops accounts, but they can join Juicy Stakes and enjoy the same network games. What Kind of VIP Rewards, Promotions, and Rakeback Programs does Intertops Offer Its Poker Clients? Intertops has the highest flat rakeback deal to be had in certain markets. Intertops offers a lucrative 36% flat rakeback program that is available to players through certain select affiliates, such as Professional Rakeback. What makes this rakeback deal even more remarkable is that it is paid out daily. Each time a player rakes $27.78, a $10 rakeback payment is issued. These payments are settled each and every day as long as you meet or surpass the $27.78 threshold in rake generated. If you fail to rake $27.78 in a given day, fear not; the amount you do rake rolls over until you do, and then the appropriate $10 payment is issued within 24 hours. The rake calculation method in use at Intertops is dealt. This is very favorable for players especially skilled ones who employ a tighter playing strategy than most people do. If you'd like to learn more about dealt and other rake methodologies, be sure to read through our explanation of various rake methodologies. Tops, as we like to call them, also has a large number of promotions that it offers to its loyal clients. Each month Tops offers rake races, cash for completing loyalty levels, gold chips that are redeemable for instant bonuses. On a recurring basis, there are also trips to live poker events, reload bonuses, and more. Most of these promotions add an equivalent of 1-5% "rake back" each, but they stack up to an appreciable extra kick in the aggregate. However, the FPP rake race is the big-value money maker that will line your pockets with gold if you put in volume. Each month , $16,000 USD is divided up on a weekly basis among Intertops' most prolific grinders. This rake race offers quite a boost in rewards to the site's higher-volume players. Effective rakeback rates of these race payments are often in the range of 15% all the way up to 45% extra! Does Intertops Poker Room Offer Me Any Deposit Bonuses? If So, What are the First Deposit Bonus Codes? Tops offers a pretty large initial poker deposit bonus of up to $1,000 USD at an incredible 200% match to your initial deposit. PROFRB recommends that new players deposit $500 in order to fully maximize this 200% up to $1,000 deposit bonus. Unlike other sites who have slow to clear bonuses, Intertops bonus has true and easily attainable value. This bonus code clears at up to ~27% cashback equivalent for flat rakeback players and upwards of 50% rakeback rates for VIP players, depending on what game(s) one plays while clearing said bonus. You'll get your bonus after signing up and depositing. Who is Intertops and Why Should I Trust Them? Is Intertops a Reputable Poker Room, Sportsbook, Casino? Intertops is an online sportsbook, casino, and poker room that is incorporated, licensed, and subject to strict oversight in multiple countries including Curacao, Netherlands Antilles, and Antigua and Barbuda. Intertops has always maintained a strict "segregated cashier" policy. What this means is that Intertops safeguards its client's funds by keeping them in separate bank accounts from its operational budget. As you will read below, this insures that in the case of some sort of financial obstacle or hardship, players funds will always be available for payout. Intertops began operations as a sportsbook over thirty years ago in 1983. Tops was quite a successful and profitable operation for the next thirteen years. By 1996, the Internet was becoming more than just a toy for enthusiasts and Intertops saw opportunity. By taking bets over the Internet in 1996, Intertops has the distinction of becoming the world's first online sportsbook! For the next half dozen years, Intertops flourished as an online sportsbook while simultaneously adding a plethora of online casino games to its ever expanding repertoire. Then in 2002, Internet poker began to grow exponentially. Intertops reacted quickly and aligned itself with Party Poker, by far the largest online poker room at the time, and became one of the original Party Poker Network operators. For the last dozen years Intertops Poker has become a well respected operator noted for its exceptionally fast and diverse cashier and game selection. Intertops Poker Site joined the Cake Poker Network, which later became the Revolution Gaming Network in 2008 and then the Horizon Network. Intertops has garnered an A rating for its sportsbook, casino, and being one of the best online poker sites since such ratings began being handed out by online consumer gaming watchdog sites. Known throughout the industry for exceptionally fast payouts and withdrawals, Intertops is the highest-rated online poker provider on The Horizon Network. When Lock Poker was a part of, and actively stealing money from, The Revolution Poker Network, Intertops took steps to protect its players from Lock's blatant thievery. Even when myriad other poker providers on Revolution faltered and could not pay their players, Intertops held firm. Intertops paid its players within stated time-frames despite all of the Lock "funny money" floating around. After Lock Poker left like a thief in the night from Revolution, leaving behind multiple millions of dollars of fraud, Intertops' actions protected its players from financial harm, and Intertops' guarantee of all player funds has proven to be true and valid. STEP 1: Clear your cookies - this is a mandatory step to ensure that you are properly placed on the rakeback program as well as receive the $1,000 deposit bonus! Click the links below for instructions on how to clear browser cookies if you need help. Step 4: Create account and USERNAME. Step 7(optional): Skype or Email us your USERNAME (case sensitive login name) and registered email address for confirmation of your new rakeback account. Step 8(optional): For the best service and fastest cash outs, it is advised that you follow this procedure in order to verify your account before you need to withdraw. Step 9: Make your deposit in the Intertops cashier to get your 200% up to $1,000 poker bonus. Step 10: Intertops has very strict security (this is good for your safety!) If you play above micro stakes games, please follow this procedure in order to increase your poker table limits. You can contact us directly via Skype or email for assistance with any of the above steps. All of the aforementioned methods and the methods below are available for non-US players to withdraw their poker, sports, and casino winnings. What about deposits? Quite a few methods are available including Visa, Mastercard, American Express, Neteller, Skrill, Bitcoin, Sofort, EcoPayz, EU SEPA bank transfer, Money Global, and Paysafecard. 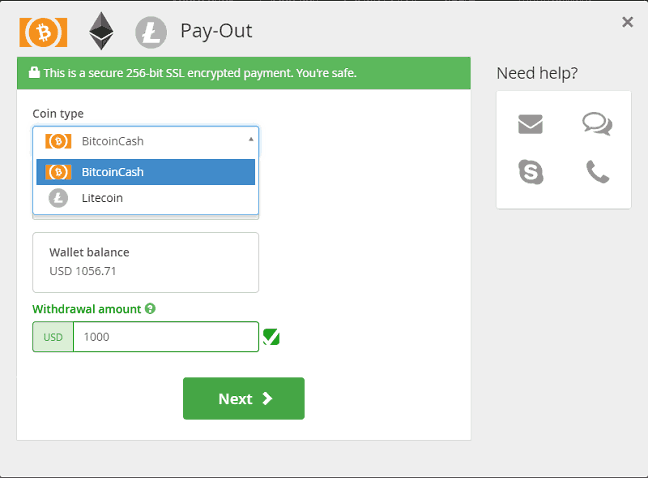 The two most recent additions to the depositing menu are the crypto-currencies Bitcoin Cash and Litecoin. If you haven't yet joined the Bitcoin revolution, then please consult our guide to BTC poker and online wagering to find out how to get started. Hold'em, Omaha, Omaha Hi-Lo, and Telesina are the game types offered. Betting formats include fixed limit, pot limit, and no limit varieties. Stakes range from 2c/4c all the way up to $10/$20 though there are a few (deserted) LHE tables up to $50/$100. There are heads-up tables, 6-handed and 9-handed full-ring games available. Traffic on this site, due to its International ROW nature, has both a Euro and an American peak time. The cash game traffic at Euro times consists mainly of Pot Limit Omaha (PLO) and No Limit Hold'em (NLHE). If you're a PLO player, the Euro peak tends to have the largest games available. During the American peak, there are more NLHE games and more PLO games, but the PLO tends to be lower stakes than at the Euro peak hours. Games tend to be somewhat nitty but sprinkled with wild Asian and Italian players who are often quite recreational in nature. Sit and Go action is sparse and has been so for a while. Multi-table tournament action is smaller in stakes, pays out large portions of the field, and culminates in a Sunday guarantee of $4,500. The wide payouts in the MTTs do serve to reduce variance, though to the detriment of big prizes up top. The MTTs are very soft, and you'll probably encounter an overlay or two from time to time to boost your returns through the stratosphere. The Horizon Network is unable to accept US poker sites players from the states of Kentucky, Louisiana, Maryland, Missouri, New Jersey, New York, and Washington State. However, USA players from the remaining 43 US states are eligible to play on Intertops. The US territories of Guam, Puerto Rico, Marianas islands, and the Virgin Islands are accepted. France, Australia, and the United Kingdom are prohibited jurisdictions at Intertops. Yet, U.K. and Australian players are welcomed at Juicy Stakes, a partner organization on the Horizon Poker Network. Sorry, France – c'est la vie. So you've decided to set up an account with Professional Rakeback on the Horizon Poker Network through Intertops. Now it is time to verify your newly created Intertops account. Verification of one's account is necessary in order to initiate player to player transfers and also to withdraw. We here at Professional Rakeback appreciate your business, and your time. To that end, we'd like to provide you with instructions on how to quickly and efficiently verify your new Intertops poker account. 1) Compose an email and address it to "documents[at]Intertops.ag" It is also a good idea to CC the poker manager at both of the following email addresses "pokermanager[at]Intertops.ag" and "pokermanager[at[Intertops.eu"
2) Include in this email a scanned copy of your Photo ID, e.g., driver's license or passport. 3) Also include in this email a scanned copy of a bill/statement that was physically mailed to your registered address. This address verification needs to be current within 60 days. 4) Title the email "Verification Documents"
5) If you are going to deposit via credit card, fill out the credit card authorization forms linked in the cashier under credit card deposits, and attach this as well along with copies of the front and back of your card. 6) If you intend to use Skrill or Neteller to deposit, then Intertops may request that you send in a screenshot of your e-wallet account showing your name and email address. The company reserves the right to request that you submit whatever other documentation it deems necessary to verify your identity. 6) Within 1-2 days your documents should be verified. In practice, on week days, most users experiences are under 6 hours! Should you have need to have your account verified more quickly, please contact us via Skype, and we will expedite your verification. Make sure your files are not extremely large. We recommend saving files as high quality .jpg images, but keeping the image size under 1 megabyte in size. Players are typically sent a confirmation email within 24 hours of account verification, though not always. Call Intertops directly to confirm if you are in a rush! Verification makes raising your Poker Table Limits much, much easier. Intertops has been in business for 30 years as a sportsbook, casino, and poker room. One way they have been able to do so is by being very conscious of fraud and proactive in their fraud prevention techniques. The online gambling industry has very high charge-back rates and is often considered a "high-risk" business when it comes to credit card processing. One of Intertops chief methods of deterring fraud is to make initial betting limits very small thus discouraging would-be criminal organizations from utilizing their platform to bleed dry stolen credit or debit cards. Practically speaking, for the poker room and those players who would utilize it, this means that upon account creation, your account is limited to $20-200 per day of action on the tables. For the vast majority of ProfessionalRakeback's online grinders, this isn't even a single buy-in! Don't worry, we can fix this! Here are the steps. Verify your account as described in the preceding section. This will typically raise your limits to at least $500. If you're a U.S. customer, contact support and get your phone number verified too. Call Intertops support and speak to a service representative toll-free at 1 800 819 0919. This will be a 2-3 minute call in most cases, they are fast! Ask them to raise your "poker table limits." They will verify your user name (this is your login name, not your table name), real name, etc, then render a decision as to your new limits. If the limit they return is less than you had hoped, politely explain to them that you are a high-volume player and would like it raised higher. They will put you on hold and very likely bump it again. If this still proves inadequate, contact ProfRB, and we will have management directly raise your limits. Other factors that influence one's limits include: stakes played, volume played, and whether your account is in good standing. If at any time you reach your limits during the day, simply call and tell them. They will up your limits in 2-3 minutes and have you back in action.Then contact us, and we will get your limits raised substantially to avoid future issue! Although we're mostly concerned with poker action, the main betting product at Intertops is actually the sportsbook. Here, you can put your money down on your favorite teams and players in MLB, NBA, NFL, and many other sporting contests. 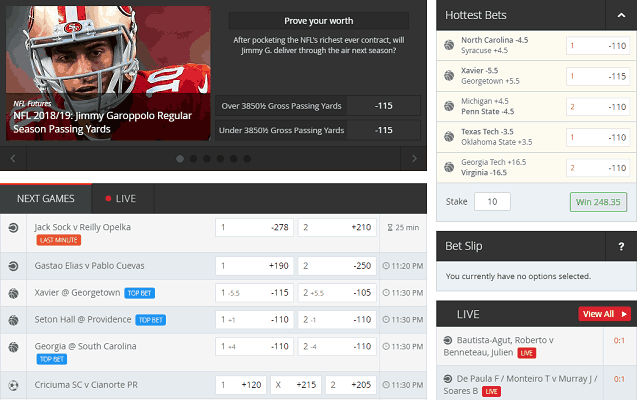 A Live Betting section lets you place wagers even after the events you're interested in have already begun! Upon making your first deposit to the sportsbook, you'll be able to choose between three bonuses: 200% up to $50, 100% up to $100, or 50% up to $200. The rollover requirements attached to these Intertops sports bonuses are 8x, 6x, and 4x respectively on both the deposit and bonus amounts. 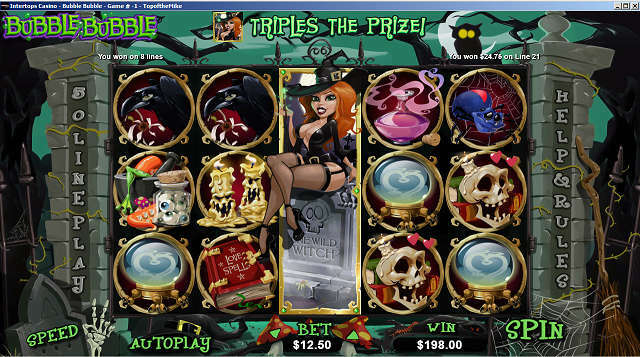 Besides poker and sports, you can bet on casino games at Intertops too. There are three separate casino products. The in-client poker casino can be opened up from the desktop poker client, and you'll get 100 free lines on Lucktap table games with your first poker deposit. The other two casinos, Casino Red and Casino Classic, are accessible from the Intertops website. They each come with a 100% up to $100 bonus. Claim all three casino bonuses to maximize your profits. Intertops provides several avenues for accessing support. You can send an email, call via toll-free telephone, communicate through Skype, or engage in a Live Chat session. After a recent poker software update, we found our Intertops client caught in an endless loop of downloading the patch again every time we ran it. We decided to uninstall the application, redownload it, and reinstall it. However, we couldn't find the installation file on the Intertops' website. The Intertops chat representative, “Ruby,” was attentive and understood what we were looking for. 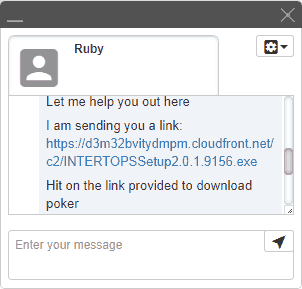 Ruby gave us a direct download link for the poker setup file, which we ran, and it worked flawlessly. Our problem was successfully resolved, and the entire chat occupied less than five minutes of our time. Professional Rakeback staff knows that there are often hurdles when working with a new online poker room. With that in mind, ProfRB has created and is constantly updating and adding onto this FAQ. If you note any errors, omissions, typos, or are unable to solve your problem after reading this FAQ, please contact us for further assistance! Enjoy! I hear Intertops has one of the best cashiers in the US facing poker market? -- You heard correctly! Intertops actually delivers on the speeds promised on the cashier page. They also score very highly in our Monthly Online Poker Payouts Report. Can I sign up to Intertops if I live in the USA? -- Yes, you absolutely can unless you reside in one of the seven states that are excluded: Kentucky, Louisiana, Maryland, Missouri, New Jersey, New York, and Washington State. It used to be the case that Intertops only accepted new customers who had been invited by certain affiliates, like Professional Rakeback, but the Intertops poker room opened up to the general public some time ago. Thus, you need merely click through our links to set up your account. Can I deposit with a credit card? -- Yes, credit card deposits have a very high % of working. **NOTE: One will have much more success with CC's if they fill out the Credit Card Authorization Form and send it in with their verification documents before depositing! How does rakeback work at Intertops Poker? -- Rakeback is 36% on the Horizon Gaming Network. Intertops is special, and our clients at some other rooms will appreciate this, in that they pay rakeback daily! Rakeback is released in $10 chunks each day as long as you raked at least $27.78 on that day. If one does not achieve this $27.78 rake total on a single day, the rake you do pay rolls over to the next day and is not lost. For example, if one rakes $100 on Monday, they will receive a $30 rakeback payment on Tuesday, and have $6 of the next chunk worked off. Should they rake another $100 on Tuesday, said player would receive $40 bonus on Wednesday ($36+$6) and have $2 of the next chunk rolled over. How do I view my rake paid? -- From the top menu in the poker software, go to My Profile > Vip Status (only works for rakeback accounts). What type of Initial Deposit Bonus am I eligible for? -- New poker players are entitled to a $1,000 initial deposit bonus at Intertops. We recommend that one deposit $500 or more to maximize this 200% up to $1,000 code. This bonus code clears at ~27% for rakeback players and ~50% for VIP players. How long do I have to clear the initial deposit bonus? -- The bonus code expires 90 days after usage whether or not the full bonus has been cleared. Will making a withdraw cancel my uncleared bonus? -- Yes. Making a withdrawal will cancel your current, uncleared bonus. However, if you have other bonuses "stacked" (more on this below), after making a withdrawal, you can begin to clear a new bonus. Same rule applies thereafter - withdrawals will cancel a current uncleared bonus. Where do I view the status of my active Bonuses? -- Log into the Poker Client, select Rewards, and click the Pending Bonus tab. I want to take advantage of this reload bonus, but I have other pending bonuses. Do bonuses stack? -- Bonuses stack at Intertops. Different bonuses can have different time frames to clear. One clears the bonus with the earliest expiration date first, even if one acquired it after another bonus with a later expiration date. This is done automatically and can be tracked in "My Bonuses". Are there any clearance requirements on deposits before I make a withdrawal? -- Yes, If a deposit has not been turned over at least once before requesting a payout, a deposit fee of 10% will apply. If a net-rake (rake minus bonuses) of 10% of the deposited amount has not been accumulated before requesting a payout, a deposit fee of 10% will apply. Are there any clearance requirements on user-to-user transfers before I can withdraw? -- Yes, If a person-to-person transfer has not been turned over at least once before requesting a payout, a transfer fee of 10% will apply. If a net-rake (rake minus bonuses) of 10% of the transfer amount has not been accumulated before requesting a payout, a user-to-user transfer fee of 10% will apply. Gold Chip Bonus, instant or clearance required? -- Clearance required. Part of my balance appears to be missing? -- No, your balance is all there and safe in Intertops' segregated and independent cashier! One may not be able to view one's full balance in the poker client due to one's Poker Table Limits being less than their actual balance. Simply go to the Intertops poker homepage (www dot intertops dot eu/poker) and log in. Choose the Sportsbook. When logged in, you'll see your full balance at the top of the page next to your username. How Do I Increase My Poker Table Limits? -- Easily, check out our section above, Intertops Poker Limits, and follow the directions to get your limits raised. Where Do I Find The FPP Leaderboards and rake races? -- You can find information on the Intertops website. Go to Poker --> Loyalty --> FPP Race. You'll see the leaderboard for the current week and the results from the previous week. 2. Click 'Rewards' in the top menu bar, scroll down and click 'Gold Chips'. Here you can see your Gold Chip meter. The small number just below the meter shows your current FPP standing and this is updated in real time. Look there at the beginning of your session and then keep track of your progress. The Instant Play client - how does that work? -- From the main Intertops Poker page, select “Instant Play.” Then log in, and you'll see the Instant Play lobby. We've reviewed the Intertops Instant Play poker product, and you can read what we have to say here. Suffice it to say that there are a few issues with this poker solution, but it's much better than nothing when it comes to playing poker without needing to download anything. Can I use my MAC for Instant Play? -- Yes! Instant Play is browser based and usable via PC or MAC. 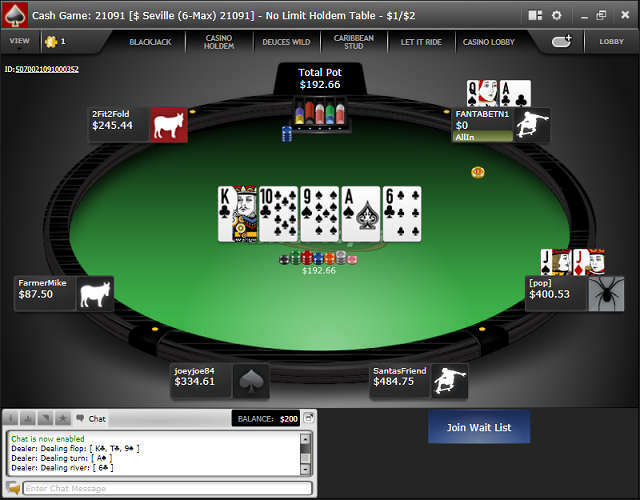 Try our Mac friendly poker sites guide for more information. Can I block my access to poker for a certain amount of time? -- You can send a request by email to poker at intertops dot eu; but please see the below "exclude from casino" for further information! Can I exclude myself from the casino? -- Yes, simply call them up or contact them via email or live support. However, do NOT even jokingly, and we mean UNDER NO CIRCUMSTANCES tell them that you have a gambling problem. Your account will be closed and you will be banned for life. Unless of course it's true and you want to be banned from the site (and potentially others by being on a shared industry database for problem gamblers). PROFRB supports responsible gambling! FOUR color deck please? -- Open the poker client. Choose "Options" from the top menu. Next choose "themes." Lastly, select "Simple (Four Color Deck)" for the appropriate game type. Options are Play Money, Cash Games, Sit and Go, and Tournaments. If a tournament is cancelled prior to starting, all players will receive a refund of their full tournament registration fees. Tournament fees will be refunded in the exact manner that they were paid. (This may include any combination of cash, Gold Chips or Gold Cards).Cancellation prior to the start of a tournamentIf a tournament is cancelled before it begins, each player registered will receive a refund of the buy-in and fee. Refunds will be provided in the same currency each player paid to register whether it is cash, ticket, gold chips, gold cards etc. However in some cases tickets may be refunded in cash. If a tournament is cancelled before the any prizes are have been awarded we will compensate all remaining players based on their play up to the time of the cancellation. First the buy-ins and fees will be refunded to all remaining players. Then 50% of the remaining prize pool will be divided equally among the remaining players and the other 50% of the prize pool will be awarded proportionately based on each player's chip count. Players eliminated prior to the cancellation will not be entitled to a refund. All awards for a cash prize tournament cancelled in progress will be cash. If the cancelled tournament has a guaranteed prize pool, only the total prize pool generated by tournament buy-ins (and rebuys & add-ons if the tourney was an R&A) will be awarded (not the guaranteed prize). If a tournament is cancelled after one or more cash prizes have been awarded we will compensate all remaining players based on their play up to the time of the cancellation. First all remaining players will receive a refund of their entry fee. Then each player remaining will receive a cash prize equal to the next prize that was to be awarded before cancellation. The rest of the prize pool will then be distributed proportionately to the remaining players based on each players chip count (if the prize pool is not large enough to pay each player the next prize, distribute the prize pool based on chip count only). Players eliminated prior to the cancellation will not be entitled to a refund. All awards for a cash prize tournament cancelled in progress will be cash. If the cancelled tournament has a guaranteed prize pool, only the total prize pool generated by tournament buy-ins (and rebuys & add-ons if the tourney was an R&A) will be awarded (not the guaranteed prize). If a Sit and Go is cancelled before it begins, each player registered will receive a refund of the buy-in and fee. If a Sit and Go is cancelled while running, each remaining player will receive a refund for the buy-in and fee and the remaining prize pool will be split among the remaining players proportionally based on chip counts. Players eliminated prior to the cancellation will not be entitled to a refund. How do I verify my Intertops account? -- The process required to verify your account at Intertops is pretty standard, and we've described it above in detail. Photo ID and proof of address in the form of a physically mailed bill of some kind is all that is necessary (PRO TIP: many online PDF copies of bills work as well). Permalink Submitted by sharkystacks11 (not verified) on Mon, 03/11/2019 - 10:59. What is the max rakeback u offer? I rake a lot. Permalink Submitted by PRB Responds on Mon, 03/11/2019 - 10:01. The maximum allowed rakeback is 36% paid daily on Intertops. This is exactly what we provide, the absolute maximum allowed to our customers!